Founded in 1966, Infant Swimming Resource (ISR), with it's Self-Rescue® program, is nationally recognized as the safest provider of survival swimming lessons for infants and young children. With over 45 years of research and development, highly trained certified Instructors committed to safety, and a proven history of success, parents can rest assured that their children are receiving the best possible instruction in the world today. ISR Self-Rescue® believes pool fences, supervision, and pool alarms are important parts of a multi-layered approach to drowning prevention. However, traditional lines of defense break down, and the over 4,000 drowning deaths per year bear a grim testament to the fact that traditional approaches are missing a key component: the child. ISR's Self-Rescue® core conviction is that the child is the most important part of a drowning prevention strategy and our over 260,000 ISR Self-Rescue™ graduates and over 800 documented survival stories are proof that children can save themselves. Children are curious, capable, and have an uncanny ability to overcome obstacles like pool fences; at ISR Self-Rescue® we take that ability and teach them skills to potentially save themselves if they find themselves in the water alone. ISR Self-Rescue® claims a 94-100% retention rate up to one year. Drowning: The #1 cause of accidental death for children under the age of 4! 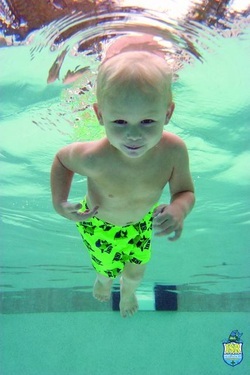 According to the Centers for Disease Control, children ages 1 to 4 have the highest drowning rates. In 2009, among children 1 to 4 years old who died from an unintentional injury, more than 30% died from drowning. Among children ages 1 to 4, most drownings occurred in home swimming pools. Among those 1-14, fatal drowning remains the second-leading cause of unintentional injury-related death behind motor vehicle crashes. But drowning is a preventable tragedy! It has taken more than 45 years to sufficiently research, test and implement the critical aspects for safe and effective infant aquatic survival lessons. The foundation, expertise, information and technique now exist so that no infant or young child has to drown. It is called Infant Swimming Resource (ISR Self-Rescue®). Rollback-to-Float program teaches breath control, correct floating posture, and the skills to attain a back float and remain floating for varied periods of time. 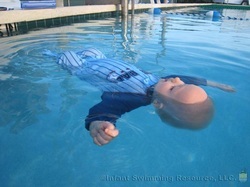 Infants 6-12 months old are taught to rotate from a face-down position in the water to a float to rest and breathe. It takes approximately 3 to 4 weeks to learn these skills. 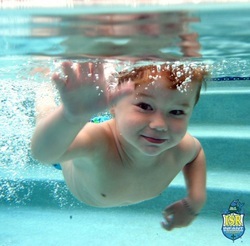 Children as young as one year can be taught the ISR Self-Rescue® Swim-Float-Swim sequence. This program teaches the skills necessary for a child to reach the steps, edge of the pool or shore. This process begins with teaching breath control. Children learn correct swimming posture, movement through the water, the rollback-to-float as well as rotating to a face down position to continue to swim. This ISR Self-Rescue® Swim-Float-Swim sequence typically takes 4-6 weeks to learn. ISR Self-Rescue® uses both verbal and non-verbal cues to teach infant and young children. Even though your child might not yet communicate verbally, he or she can learn the ISR Self-Rescue® technique. Remember, your child may not talk, but he or she has learned to crawl, walk, and run. That is the only skill they need to find themselves in water danger.